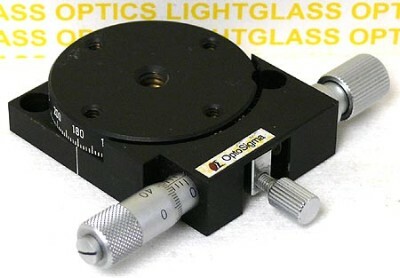 This OptoSigma 124-0035 Rotation Stage has a 40mm diameter top stage, and is an English model. With full 360 degree rotation, and a OptoSigma Actuator for fine positioning, This compact brass stage offers resolution of 20 minutes of arc, with a 5 pound load capacity. The top of this rotary stage is drilled and tapped for metric M4 fasteners and the overall height of the stage is a minimal 13mm. Very well made and stable.